When buying beds for your kids, you need to make sure that it is safe and sturdy. They should not find it hard to climb onto their beds. The bed must be comfortable enough so they will not disturb you in the middle of the night complaining of their bed. Likewise, you also need to take into consideration that kids have other things they want to have in their bedroom. They put their stuff toys beside them. The age of your kid will also be another factor to look into when buying beds. Here is a list of the different kinds of beds for your kids. Toddler beds as the name implies are meant for toddlers. These are kids from ages 1 - 3. These beds are not that high, which makes climbing on the bed easier. Edges are usually rounded to keep the child from being injured. 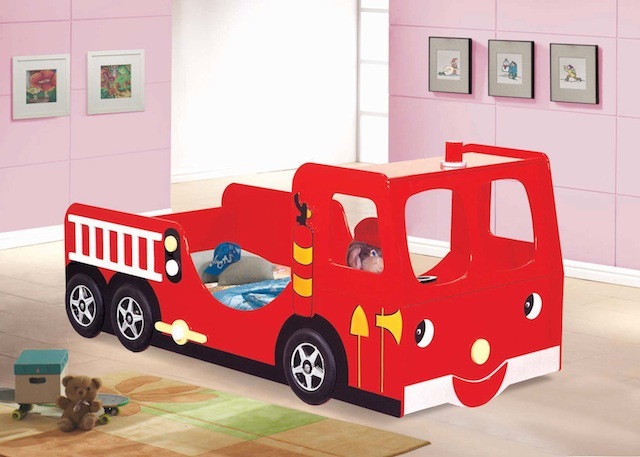 They also have side rails so your kid will not fall in case he makes a lot of movement while asleep. Sleigh beds usually feature curved headboards and footboards. Some were given modifications with a square headboard and curve footboard. This design gives the bed a regal look that can be fascinating for children, as they get to feel like they are princes and princesses. Most of these beds also have drawers underneath providing for more storage space. Car Beds, of course, are shaped like a car. This can be used for kids between 3 - 6 years old. This kind of bed will give the feeling that the bed is also a plaything. Bunk Beds are the most common bed for kids. This is a very good space saver, as 2 kids can sleep on this bed yet have their own space. They are vertically built so children will have more floor space. It is good to have if you cannot afford to have single bedrooms for your children. Supporting the top bed are columns and a ladder is affixed on the side of the bed. They are likewise called loft beds. These beds are suitable for kids ages 9 - 12 years old. High sleepers are another type of kids' beds that save on space. The bed is on top and underneath it are drawers, a desk and a chair. The lower part provides a study area for the child; thus, there is no need to purchase another furniture like a study table. A stair is also provided so the child can climb on his bed if he is already sleepy. This is ideal for children who are starting school, as this bed will also teach them on how to organize their things. Futons or sleeper sofas are ideal for teenagers. These beds can be converted to be sofas during the day and beds during the night. Thus, teenagers can invite their friends inside their room to practice some dance steps without bothering of the limited space. Futons are sturdy and are likewise available in twin size. This is just a few of the available beds for children that are sold in the market. You can also find double and queen size beds for kids. 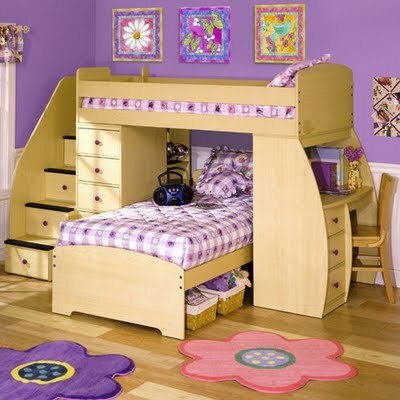 Whatever type of bed you will buy for your child, always ensure that it is durable. Aside from his age, always consider the weight and height of your child. You cannot get a bunk bed if your child is quite tall for his age nor get the same is he is on the heavy side. A single bed is better for these children and maybe a bed that is intended for adults. Choose bed wisely for your child's safety.